It's been a busy few weeks on the deputation trail for the Pittsleys. I spent much of the week of 22-Feb continuing to call pastors to schedule meetings. I'm making progress on that front, but it's an ongoing project and prayer request. We need more meetings and more supporting churches to be able to start serving in Kenya. I also spent a good deal of time preparing for a week-long trip to California that I took last week. In addition to the normal planning and packing, I needed to track down and purchase a couple pieces of equipment that would allow me to do my DVD presentation in small churches that do not own a data projector and DVD player. Last Sunday I was able to present our ministry to rossway Baptist Church in Bakersfield, CA. The young church had never had a missionary in to present his ministry before, so it was a neat opportunity to introduce them to the worldwide cause. Pastor Mark Brock challenged the congregation from Romans 10 and the church's responsibility to worldwide missions. We're so thankful for the welcome and astounding generosity of this young church. I knew both Pastor Mark and Pastor Phil Elie while I was in seminary, so it was also nice to be able to reconnect with them and visit with their families during my visit. We hope to have an opportunity to visit again as a family when we're on our way back through from other meetings. Monday and Tuesday were the last two days of a symposium for The Master's Academy International. TMAI is an organization that facilitates the creation of theological training schools all over the world. It has come to incorporate a network of 15 like-minded theological schools and teachers around the world. It was a privilege to be invited to observe as the teacher-missionaries presented their ministries. I was so glad to have to opportunity to listen to people experienced in the same tasks that our team plans to be involved in. I'm certain that hearing their joys and challenges was a foretaste of what is in store for us in the future. At the end of last week, I was able to meet up with my ministry partner Dan Huffstutler at a pastors' conference where we were both able to meet some new contacts and reconnect with some old friends. 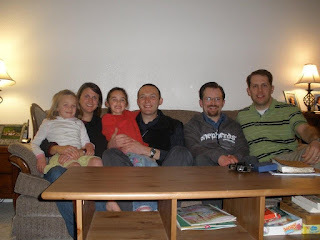 We stayed with the Dunhams while attending the conference. Kyle Dunham has been a teacher at one of the spiritual leadership conferences that we've held at the Weavers' camp near Nairobi, Kenya. I had one class with Kyle in seminary, but I never really got to know him or his family, so I am glad I had the opportunity to deepen the acquaintance.